Unlike regular hair rollers, hot rollers are heated before they are placed into your hair, creating a much quicker curl. Also known as “hairsetters”, they are a convenient way to get those curls you have always wanted. They easily place just the right curls you need and want, and offer a longer lasting, healthier curl than curling irons. With the right hot roller, every day can be a good hair day. There are a variety of brands offering a variety of types, and deciding between them can be difficult. Making sure you choose the right hot roller will depend on the type of curls you are looking for, the type of hair you have, and the size of your budget. Hot rollers differ in roller material, finishes, and heating technology, so we have broken down all the types of hot rollers for you to compare, helping you to decide on just the right hot rollers for you. Sponge or Steam Hot Roller Sets: Steam hot rollers are fast to heat and use steam to create and set curls in as little as ten minutes. Steam is a great heating technology for getting curls quickly, and these hot rollers are ideal solution for your morning routine. Steam hot rollers work by you putting water in the unit's reservoir. When you plug the heating unit on, it heats the water into steam. The rollers absorb this steam--it takes a few minutes for the rollers to be ready. (There will be an indicator light on the unit to tell you when the rollers are ready.) The moisture in the steam shortens the curling period considerably--they will usually be more effective than rollers that employ heat alone. 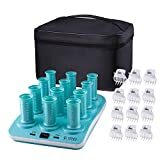 Ceramic Infused Hot Roller Sets: Ceramic rollers are the best solution for frizzy hair as the heat created by these hot rollers is generated by ions and infrared heat. They are PTC (= positive temperature coefficient) devices: The hotter they become, the more electrical resistance they create. This makes them turn off when they reach the desired temperature. The heat of these rollers sets curls by sealing the hair cuticle and creating more shine. The Remington H9000 Pearl Ceramic Heated Clip Hair Rollers utilize ionic conditioning to seal the hair cuticles and reduce static. The rollers and the clips are both heated--this applies heat to the curls from the inside and outside simultaneously. Some units heat up the rollers in as little as 90 seconds, while others require 2-3 minutes. Wax Core Roller Sets: Because this type of hot roller holds the heat well and for longer periods of time, these hot rollers are ideal for straight or fine hair that would normally find curling difficult. Offering a much stronger curl, they are the perfect way to get even the most resistant hair curled. 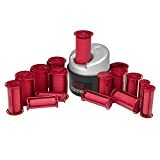 The Remington H5600D 20-piece Multi-Sized Roller Set are ceramic hot rollers with a thermal wax core. It is especially effective on thicker hair. By Rolling Method: Rollers come in a variety of roller types and materials. Besides self-grip rollers which are designed to be used without any heating technology, these are the main types of rollers used in a hot roller set. Ribbed Rollers: Hot rollers with a ribbed finish offer much easier removal once the curls are set. This kind of roller is ideal for people who need to maximise their time by getting curls done in the morning and are looking for something hassle-free. Flocked Rollers: These rollers offer a soft padded surface that is healthier on your hair. Producing soft curls with minimum damage, they are best suited for people using hot rollers more often. Coil Rollers: These rollers are made from ceramic, tourmaline (a semi-precious stone), or a combination of the two. Using ions to curl hair, they leave a smooth finish that seals in your hair’s moisture. As an ideal solution to frizzy hair, they add shine to your curls. These rollers are cool to the touch on the outside, and apply the heat only where you roll your hair. It is recommended to hold the roller in place, and wrap the lock of hair onto the roller. Note: Be careful to handle the hot rollers only by their edges! Flexible Stick Rollers: These rollers allow you to curl and twist your hair into different shapes without the need for clips. These rollers are available as hot rollers or non- heated rollers, depending on what you are looking for. Self-Grip Rollers: These are rollers that don’t require a hot roller heating system. These rollers come in a variety of types: plastic, foam, Velcro, magnetic and flexi-rod. Velcro rollers are best for naturally-smooth hair--there is less of a risk of getting your hair tangled. Velcro and foam rollers are less damaging, since they don't heat up--the heat has a tendency to dry out hair and create split ends. Longer-lasting curls: The highest rated feature of a hot roller is curl longevity, and hot roller owners whose devices create longer lasting curls are most satisfied. Hot rollers that keep curls longer are treasured, and choosing a best rated brand correctly matched to your hair type and needs will ensure great satisfaction. Heat: Hot rollers that are quick to heat up and stay hot for longer are rated much higher than rollers that don’t. Hot rollers that heat up quickly save valuable styling time and the longer they stay hot for, the easier it will be to set your curls. Comparing manufacturer specs and wattage will help determine which hot roller will heat up adequately. Quality: Choosing a reputable brand will ensure all the pieces of your hot roller set are built to last, and will prevent disappointment further down the line. Consumers who have opted for quality products rave about the quality of their rollers, clips and the case.To ensure you get more use and that your hot roller set is a good investment, opt for a well-known quality brand. Roller Size: Roller size reviews depend on what people’s needs are, and if they bought appropriately sized hot rollers based on their styling needs and hair types. Whether you choose big, small, or mixed rollers, if you ultimately pick hot roller sizes based on your hair type and styling needs, you can’t go wrong. Some brands use color-coding, so that you can tell the difference between the different sizes. For example, the Conair HS18WR Hot Sticks Hairsetter Flexible Rollers has 7 pink rollers and 7 blue rollers. The pink rollers are 1/4" diameter, and the blue rollers are 1/2" diameter. Removing the rollers: In order not to ruin the results of the rollers, you have to remove the rollers properly. Hold the roller in one hand and remove the clip with the other. Always remove the rollers from the bottom of your hair first, by unwrapping your hair from the roller--then move to the top sections. This will prevent hair from getting tangled. Don’t pull the roller out of your hair--that will ruin the curl, and may even damage your hair. “Cool” to the touch: Most hot rollers are cool to the touch, and to prevent injury and unnecessary hassle make sure you choose a top brand hot roller that offers this feature. Number of rollers in the set: For faster rolling and bigger curls, hot roller sets that have fewer and bigger rollers are what you are looking for. Variety of roller sizes: When choosing between roller sizes in your hot roller sets, think about what kind of curls you are looking for and how many options you want. A hot roller set where roller sizes can be added, mixed and matched will give you more curling varieties and allow you to make varied curls. For a more consistent curl, choose a hot roller set that offers one size of rollers. A large set of rollers will usually mean a wide variety as well. 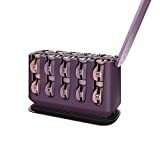 The the BaBylissPro Nano Titanium Professional Rollers include a wide range of sizes in their set of 30 rollers: it includes 6 small (3/4" diameter), 8 medium (1" diameter), 8 large (1-1/4" diameter) and 8 jumbo (1-1/2" diameter) rollers. These settings can be used as an indication of what temperature setting is appropriate for your type of hair. Section of hair should match size of the roller: Even though it might be more effort, roll a section of hair that is no wider than the width of the roller. Trying to roll too much hair at once on the roller will take more time to produce curls. Roll hair tightly: Try to wrap your hair around the roller tightly--the tension is essential for creating proper curls. Auto-shut off: Some brands of hot rollers, like the Paul Mitchell Neuro Cell Premium Hot Roller System has an auto-shutoff feature, in order to protect the heating elements. Hair styles: Another thing is to consider is the styles you want to do on a regular basis. Larger rollers create less of a curl, while smaller rollers will give lots of smaller curls. Large curlers are not recommended for fine hair--fine hair needs to be wound more tightly to maintain a curl. Alternatives to hair clips: Many rollers require that you secure the hair in place on the roller with a clip or bobby pins. 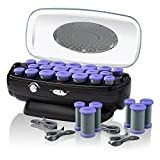 For example, the BaBylissPro Nano Titanium Professional Rollers employ either plastic or metal butterfly clips to keep the hair in place on the rollers. But rollers that use shields instead of clips are better for damaged hair and help prevent further breakage. For example, the Caruso Professional Molecular Steam Rollers (Model #06749-02) allow you to wrap your hair around the roller, and secure it in place with a shield that you fit around the roller. Alternatively, the Conair HS18WR Hot Sticks Hairsetter Flexible Rollers have a curl loop design to secure the hair in place--it also replaces the need for clips. The rollers have interlocking ends to secure the hair in place. Using conditioner properly: Conditioner makes your hair softer. That’s an advantage in some respects, but it will also keep it from having long-lasting curls. To get the most out of your hot roller and make it easier to keep the curls your are setting, try skipping conditioner during your next wash. Another possibility is to wash your hair a day before you plan to curl it. Using volumizing hair styling products: There are volumizing products (for example, mousse, gel, wax, gel spray, hair spray or lacquer) that add body to your hair. They will also make it easier for the rollers to hold your hair and give you a longer lasting curl. They also add grip to your hair strands. Curl-enhancing products: There are mousses and sprays that help enhance curls. This is especially useful for fine and/or straight hair. Since such hair doesn’t maintain their curls for very long, a curling mousse will ensure that the effects last for a while. Leave the rollers in until they cool completely: Another rolling tip is to leave hot rollers in until they have completely cooled to make sure you are left with the best possible finish. Hair-protecting treatments: If you plan on putting heated rollers into wet hair, using a smoothing cream or serum will help protect your hair and ensure less frizz. Use on damp hair: The majority of rollers are put into wet hair which is left to dry naturally, or used with a hair dryer for faster results, and are safe enough to leave in overnight. The recommended method is as follows: It is recommended to wash and blow dry your hair until almost dry. Set the rollers in place, and wait 10 minutes for the curl to set, and then blow dry the curls on cool heat. Hairspray is the best hair product for curled hair and will make sure your curl stays longer - especially helpful when hot rolling dry hair. Conair: Conair, founded in 1959 and headquartered in East Windsor, NJ, is a leading name in health and beauty products. 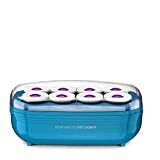 Their quick-heating hot rollers and hair setters come in convenient heating trays that double as carrying boxes, and there are options to suit any budget. 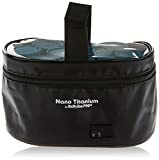 T3: Started by one man in 2004 with the innovative Tourmaline hair dryer, T3 is now a global brand. Their Voluminous Hot Rollers are the only hot rollers they make, and the attention to detail is evident in the excellent reviews they’ve garnered. The T3 Volumizing Hot Rollers Luxe have been selected among the top 10 hair rollers in 2017. They use dual-temperature settings, to create high volume and wavy hair. You place the rollers in the base, set the desired temperature setting, and wait for the white indicator light to go on. That shows that the rollers are at the desired temperature. The T3 rollers are suitable for shoulder-length hair. Caruso: are makers of professional "molecular" steam rollers, employing shields instead of clips to secure the hair on the roller. Their rollers come in sets of 6 sizes: petite, small, medium, large, extra large and jumbo. The rollers work with the Caruso hairsetter.